The first battle took place a month later. They had followed the direction of Bartok, and had stayed until they were all at full strength, and when they left the Fortress, they had all their weapons, armor, staffs, amulets, rings, and the Dwarf made shirts on, and they had left the wine, mead and ale in the Fortress, they were all carrying Ambrosia, and that would fortify them better than any of the other things. They had left in the morning and were headed towards the Free Lands, that would take them away from the Fortress and safety, they had needed the Fortress for a time, but that time was behind them now unless they won. If they did, most of those who survived would be loading into the long boat and going to Benelvin. The rest would have a choice, stay at the Fortress and form a cadre of Wizards and Sorcerers who fought to keep any Dark Mages or Necromancers from entering this world and wreaking havoc on the Free Peoples of the lands. They would keep them at bay, keep them in the Dark Southlands, and prevent them from crossing the line to the North. To do that, they had to win this war with Morcandon and the Dark Mages. He was dangerous, and he was evil beyond all compare, except for maybe the Fallen, and they wouldn’t be crossing into the North, there were safeguards in place put there by the Nephilim, with the help of the Archangels. They had travelled at least two hundred miles before running into their foe. It wasn’t Morcandon, it was the Dark Mages and some Ogres. They were hard to kill, you had to put a sword or spear through their mouths and into their brains. The Dwarves had made spears at the Fortress for all of them and they carried them with them. The Dark Mages had attacked using Magic, and it was thee Dwarves who entered into battle with them. They would be impervious to their Magic Spells, and they dispatched them within a few hours. It was the Ogres who were the real problem, they were as impervious to Magic as the Dwarves or Goblins, and harder to kill. They had been Giants at one time, who had wandered into the Southlands, before the Nephilim had placed guards to keep them in the east. They were tormented by the Fallen who then changed them. That caused them to be Ogres and Trolls, and now they were as natural a beast as the Goblins. They were different though, they weren’t inherently evil, but they were touched by it, and controlled by it, in a way that couldn’t be undone. Many Wizards and Nephilim had tried, they were slow of wit, and didn’t move quickly, they were dangerous though, especially when aroused with anger, and the only match for them one on one, was a giant, and they were all in the east. They finally won free of the battle, the last Ogre was felled by Lorelai the Fair, she was so quick and deadly with her spear that when the Ogre fell, they hadn’t seen her thrust the spear through his mouth and remove it before he fell. She was standing over him with her hand on her sword and the spear over her shoulder. She was the deadliest wielder of weapons that anyone but Lazolon and Bartok knew, she was the daughter of Davina and Threndon, a secret they shared with no one, not even Sarzon. Once they had finished the battle, they piled up the bodies and burned them. That was a practice that they must keep up with during these battles, they couldn’t allow the Dark Magic to gain a hold in the North by burying the bodies, they had to burn them until they became ash. No one left a trace of anything, not even of the Dark Mages that the Dwarves had dispatched. It was a good first battle, and all of them were feeling good, but were wary, if they had brought Ogres, there could be Trolls, Goblins, or any of the other creatures to deal with. They had seen no signs for days when they came upon the smoking ruins of a Hamlet, which brought back sharp memories for Sarzon, this was just as it had happened to him. Only this time, there weren’t any survivors, the burned all the bodies, and cleared the ground of Dark Magic, and moved on, following the trail of the Dark Mages and their evil companions. They had tracked them for two more days when they caught up to them, they were in a camp, waiting for them. They knew they were on their trail and were trying to set up an ambush. There were several Manticores and Chimera with them, as well as a Troll, and four Dark Mages. This wouldn’t be an easy battle they would have their hands full. The Dwarves took on the Dark Mages again, and this time, they were more prepared than last, they went in with their axes or spears, and they had speared two of them right away, the other two were more experienced and left them to fall. They attacked the other two and were hard pressed to deflect the bolts of magic, several of them had already sustained wounds. They fought on, and kept going until they defeated them. The others were having a tough time too. The Troll was the hardest, he was bigger than the Ogres and his hide was impenetrable, the only way to take him down was to spear him where his head and neck came together, it was Lorelai who buried her spear in him, she couldn’t jerk it free though, and he fell on top of it and her. Lazolon went to help her out from under the beast when her sword pierced through it from the bottom side and she climbed out covered in the gore of his insides. She smelled horrible, but continued fighting on. They started taking out the Manticores and Chimera one by one, and when they had finished, the Dwarves helped them stack the bodies and Bartok brought down fire with magic and it consumed them instantly. They all looked at him, and he said it was easier than waiting for a fire to burn them up. The fire he called down was blue, and it was a signal to all the Dark Forces that Bartok the Blue was in the battle fully. He had wanted to send a message to Morcandon, that he was in the open and ready for whatever he threw at them. That was going to make the battles hot, he knew that Morcandon would come, how could he resist, his vanity alone would bring him back to the North, and enter into a Wizard’s duel with Bartok, which was exactly what Bartok wanted. How long though would depend on how many of his Dark Mages and evil creatures they killed in the next few months. Bartok didn’t expect Morcandon to rise to the bait immediately, would realize he was being baited, and would stay in the south, but as they continued to destroy his forces and the signals from Bartok continued to show, he would eventually become incensed and would come. Bartok wouldn’t be sending anyone south, no one was going beyond the border, he had planned it that way. They continued travelling, he had decided to keep the force of Wizards and Sorcerers all together, the Dwarves were indispensable, and the only way he would let them leave the group was if they needed them to hunt down a Goblin Horde. They had seen no evidence of any passing evil, and was about to turn them around and return to the Fortress, when several of the raven spies flew overhead. They hadn’t seen any bats, but they were sure to follow. It gave Bartok and idea, he sat everyone down, and told Sarzon to shield them from the hearing of the ravens. He didn’t care if they saw them, just didn’t want them to hear them, Sarzon did, and Bartok told them his plan; he wanted to draw out the creatures and Dark Mages, he wanted them to stage an argument between the leaders of the Dwarves, Elves, and Men. Then they would split up and go their separate ways for two day’s journey and then camp. They would meet up at the river Gihon in four days, they all agreed. The dust up was well staged, they all took off their separate ways, the elves melted into the forests, the dwarves when towards the mountains, and the men went towards the river south of where they were. the last to leave was Bartok and Sarzon, the were heading to the central point of the three groups and would wait there for two days, then proceed to the river. They had all gone and followed the plan they had outlined to the letter. The elves were attacked by a group of Manticores, the dwarves had to deal with Goblins, and the men had faced some Chimera. Bartok and Sarzon had tangled with another Troll, and an Ogre, and when they were preparing to leave, two Dark Mages appeared and they started hurling lightning bolts at them. They deflected the bolts, and started to battle them back with their weapons, they weren’t worried about the Magic, they had on their shirts, but what they were worried about was getting close enough to engage them without using Magic. It was important, they needed to conserve their strength. They finally got an opening and went in with their swords, they had taken half a day to get the opening, and when they advanced they were able to keep the Dark Mages from escaping and they finished them off with a deft sword stroke. Bartok brought blue fire to consume them, and then they departed for the river at a run. They knew that the battles were going to get more frequent, and they were headed to meet up with the others to be at full strength. It could get very bad soon, and it would be a while before it got better. They had made the river, set up camp, raised enchantments for the first time, and settled in to wait for the others. The Dwarves came in first, they had destroyed over two hundred Goblins, and had actually burned them for a day, they were very thorough. The Elves arrived next, they had taken out a nest of Manticores, twenty-five in all and had used elven fire to burn and consume the bodies. The men came in last and they came in on the run, they had fought the Chimera and destroyed them, burned the bodies with Magic fire, and had come this way to meet up, just as they were about to crest the hill that would bring them on the last leg of the journey, they were set upon by a very angry, very large, Ogre, they had fought him until they won, set his body on fire, healed the ground and then they saw the bats. That’s what had them on the run, the bats were the largest group of bats they had ever seen and the bats were huge, made large by Dark Magic. The Men ran into camp, and Bartok raised the enchantments just as the bats flew into sight, he sized them up, there was at least five hundred of them. They came within sight of the camp and Lazolon destroyed them with Elven Fire. They were okay for at least a day, two on the outside, and if they were still in the area, they would be dealing with more than they were prepared to fight. It wasn’t going to take that long. Bartok decided that they needed to return to the Fortress, and they weren’t walking back, it would take weeks to get back. They had been in the field for five months and the nearest they could make in a day going in a straight line was about fifty miles, it would take them weeks. He gathered all of them together, had Sarzon raise the enchantment to block out the sound and told all of them they were going to transport by Magic to the Fortress. That meant that each of the strongest of them would need to place their hands on the Dwarves so that they could all move at once. It was risky, they would use a tremendous amount of Magic to move that far, and would have to use their own reserves to do it and not damage the land. They all drank two large helpings of Ambrosia, they were all charged almost to the point of being electric, they gathered and placing their hands on the Dwarves, at Bartok’s command they dropped the enchantments and transported the group all at once, they arrived at the Fortress, Sarzon brought down the door, and they ran inside, raising the door and dropping the portcullis behind them. They were all exhausted, they would need at least two weeks to rest up before they could restore their magic fully, which meant they weren’t going to use any more Magic other than what it took to keep their shields up around their minds. They were all exhausted, two of the dwarves were badly injured, and they were being tended for. One of the elves had a bad wound, and five of the men. They had a force of one hundred, only eight had sustained major injuries. They had all sustained minor injuries, ones that were healed with magic, they used all the magic they could spare on the eight, Bartok went into his stores of potions and brought out the necessary potions to heal the eight according to the injuries they had sustained. That would keep from depleting their magic and allowed them all to regain their strength. After a week, most of them felt restored, they weren’t at full strength though, they needed another week of not using Magic to be fully mended and the eight would require an additional week. They had recovered remarkably well. They were only weak now and rest and food along with a cup of Ambrosia daily would have them back in two weeks. They kept a watch out for spies, and were astonished when the King of Birds landed in the courtyard. Elric the Fair had rarely ever visited the Fortress and usually only outside. But he had entered the fortress and was on here to talk to Bartok alone. they all went inside, Elric wouldn’t fit through a door unless Bartok made it larger with Magic. Elric told him they were fine where they were. Elric spoke to him for over an hour, and the look on Bartok’s face went from concern to elation, to sorrow, and back to a blank, during the time they spoke. He motioned for Elric to wait for him, and he went inside and gathered his things, told Sarzon that he would return in two days, and not to open the gate no matter what he saw outside, especially if he saw Bartok on the outside. He would return the way he left, and without further explanation, he left them and flew off on Elric’s back. They were all staring at him as he shrank in the distance. He would explain when he returned. That much Sarzon was sure of, but right now, they all had questions and he raised his hands, and told all of them to hold off with the questions, Bartok had told him where he was going, and he would have to explain when he returned. They had no choice but to wait for him to return. They kept themselves busy, fencing, crossing staffs, and shooting targets with their bows. Each night they would dine, and talk, and then sleep. After two days, Elric brought Bartok back, and they went on as before, waiting for Bartok to explain. He did that night. He waited until they had all eaten, and had some of their favorite drink, the dwarves had lit pipes and the men and elves had joined them, then Bartok cleared his throat and spoke. “I know all of you want to know where I went, and why, I am going to tell you, but you mustn’t interrupt. It was a journey of the most serious kind. I was needed in Benelvin and Elric was kind enough to take me there and bring me back. The bird made it there in three hours, and when I landed in Fair Haven, I was met by Delvina. She took me to see a great injustice done by the Dark Mages. How they entered into Benelvin is still a mystery, but I restored the land and the trees, and closed the hole they had come through and sealed it with an unbreakable seal. Benelvin is whole and strong, but we must not be lax in our diligence towards the Fortress. Tomorrow we will be setting into the fortress the same unbreakable seal so that it doesn’t happen here. Elric is on his way to the east to warn the Nephilim of what is happening, they are the only ones who can strengthen the southern border. Until they do, we are to remain here and wait. Hence the need to bind the fortress with an unbreakable seal. It won’t affect our ability to come and go, but it will prevent the Dark Powers from breaching our walls. The next morning with the rising of the Sun, all of them gathered together and worked the Magic to place an unbreakable seal under the Fortress. It would extend forty yards beyond the walls, and would also prevent any malevolent beings from entering from above. It took most of the day to perform the Magic, but in the end, the Fortress was sealed. The only one who could break the seal would be an Archangel or God himself. No creature of Darkness had the power to break the seal. Once it was in place, they were all exhausted, they would need more recovery time, that was why they placed the seal. It would be a long time before they could leave, at least a month, and then it would depend on how many of them were fully recuperated. The Dwarves were already fit for battle, they weren’t spell casters and weren’t involved in the laying of the seal, they were going to be cooking and tending the others until they regained their full strength. They were well stocked with supplies. The long boat was large enough to bring at least three hundred, they had brought ninety, plus the cargo Bartok had requested. They had casks of wine, mead, and stout, they had casks of Ambrosia and his garden held all the necessary ingredients to make more, he even had several large crocks of honey in the larder. Enough to make at least two or three hundred gallons and he had plenty of barrels in the cellar. They had plenty of meat, and his garden was enchanted so that it produced year round and the plants didn’t die, they could hold up here for five years if necessary, even though he was sure they would only be here a couple of months. The Dwarves wanted to hunt, Bartok could see no harm in them hunting, they couldn’t raise and lower the door, and if they got into trouble, Sarzon, Lazolon, and Lorelai were all at full strength and could go to help them. He allowed them to take off to hunt. Sarzon lowered the door for them, and he gave them a silver hunting horn that had been given to him by one of the dwarves in Green Haven to call them for the door to be lowered. It couldn’t be used by anything or anyone of Dark Magic, it was pure silver, and had Enochian runes on it. They marched out of the Fortress, they hadn’t kept the horses, they had returned to Benelvin, and they went on foot. They wanted a big boar, or one of the cattle with the huge horns an Auroch for the larder, hopefully both. They had been gone for most of the day when Sarzon heard the horn. They climbed the parapet and there below were the Dwarves waiting for the door, they had gotten a boar and the Auroch. They were singing and carrying on when a Dark Mage appeared behind them, they were all within the area of the seal, and Sarzon lowered the door. They rushed in and he raised the door. The Dark Mages had hurled bolts of Magic at them as they went through the door, and the Seal deflected the Dark Magic. They hadn’t been expecting that to happen. They believed they were going to get through when the door came down. It was then that Morcandon the Black appeared and combined his Magic with theirs, they felt it hit the seal get deflected, Bartok rose then and went to the parapet to see his old apprentice. He was wroth, he hurled bolts and curses, insults and vile strings of filth at the Fortress, and try as he may, they couldn’t penetrate the seal. Morcandon was so angry he forgot himself and called up to Bartok, he wanted to parlay, outside on the grounds beyond the door, Bartok, didn’t hesitate, he told him to go back to the South land and never return to the north again or it would be his ruin. That just incensed him even further. He became so wrathful that he began to foam at the mouth and was in a rage. He finally disappeared with the Dark Mages. They would have peace for a while, but it would be the battle of battles when they left the Fortress. Morcandon would have spies sitting here waiting for them to drop the door and when they did, he would materialize and the final battle between Bartok the Blue and Morcandon the Black would take place. They were inside the Fortress for another two months, when Elric the Fair reappeared. He landed in the courtyard and this time he was in great spirits, they had succeeded in getting the Nephilim to come and reinforce the southern border, they had called upon the Archangels for help and they had placed a series of unbreakable seals along the border. It wouldn’t keep the Dark Mages or Morcandon the Black out, but it would prevent the Fallen from crossing over into the north. The Nephilim said that they wouldn’t participate in this war, but it was their duty to YHWH, to keep them contained in the south. The Archangels had placed the seals, and now they would only have to deal with the Dark Magic and the evil creatures that they sent. He asked why the seal under the fortress had repelled the Dark Magic, and Elric the Fair asked what symbols did he place upon them, when he told them, he said the symbols warded off Dark Magic by turning it into dust. The same as the one in Benelvin, only difference was in Benelvin good and pure Magic flowed from everywhere and the seal set there was maintained to prevent anyone from entering by means of Dark Magic, they could still come under a direct attack, and the enchantments placed there would only prevent them from entering where they chose, the road could be traversed if they knew how. Here the seal was placed with the Magic of Seventy, a Holy number, one of completion. That is why they can’t break through the seal here. Once Elric had left, Sarzon had a few moments to ask Bartok what the letters that Elric had used meant. Bartok replied, “It is the Name of God. It means to breathe life into. But is spelled in the language of Adamian YHWH. He was astounded he never knew that God had a name before. He only heard him referred to as God. It was the first time he had felt such reverence towards God, then Bartok told him, “All things have names, even the Fallen, their leader and Chief is Lucifer, or Satan as he is now known. He is responsible for all the evil we fight in this world. He brought the seeds of Darkness into Men, and it was the Nephilim bringing Magic into the world that released the Dark Magic, it released the Magic of Light as well, and that Magic is good.” He asked Sarzon if he had any more questions that couldn’t wait, he said no, he would talk later in his quarters with Bartok, or if he wasn’t available, he would talk to Lazolon. Bartok smiled and they went into the Keep to see to the wounded and to make sure they were about ready to take the fight back to Morcandon the Black and his evil hordes. That night he wanted to talk more about YHWH, and what it truly meant, Bartok sat him down and opened several books, he told him that “YHWH” wasn’t his name, it was a way of referring to God as “The One Who Breathes Life”, he showed him some other rendering for God such as Adonai, El, El Shaddai, El Elohim, and more. He wanted to show him all he could, but Sarzon asked him if he could borrow the books to study, it made Bartok smile, he gave him the books, and told him they were his gift to Sarzon. He read all he could about God, and studied it with great zeal. He wanted to know all that he could learn. He didn’t neglect his other studies, this was his own private studies and he would share with anyone who asked what he had learned, he asked the men, elves and dwarves about God. He even learned the symbol that represented God, and was going to incorporate it into his personal sigil when he had time to draw it out. It had to be a perfect representation of who he was. That was the power of a sigil, it represented who you really were and was a source of protection if done correctly in Enochian. 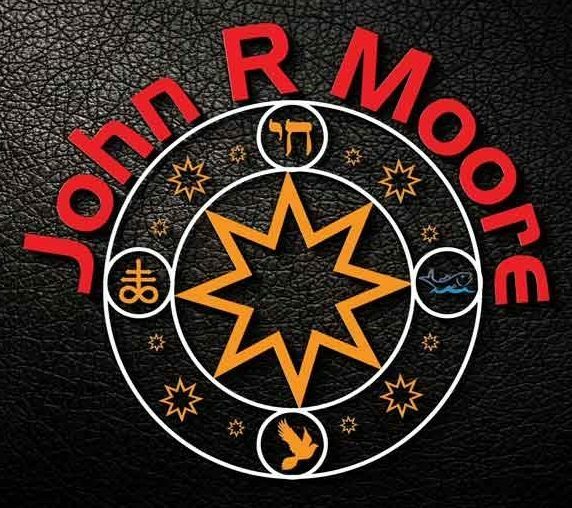 The more he studied it the more he understood the nature of the YHWH, then he found what he was looking for, his name and the symbol for silver, the word for Wizard, and the word for life in Enochian, and the Enochian word for God. That was his sigil.